Laura Ingalls Wilder (February 7, 1867 – February 10, 1957) was an American author who wrote a series of historical fiction books for children based on her childhood in a pioneer family. Her best known book from The 'Little House Series' is generally regarded to be Little House on the Prairie. Laura’s simple but detailed writing style reflects the home-spun entries from her own diaries written as a pioneer child. Laura Elizabeth Ingalls Wilder was born in Pepin, Wisconsin to parents Charles Ingalls and Caroline Quiner Ingalls. Charles' paternal grandmother was Margaret Delano, who was a direct descendant of Mayflower passenger Richard Warren. Indeed, the story of Laura’s life cannot be told without mention of the challenges and trials of her parents and grandparents who set out westward in covered wagons to find a more prosperous life for themselves and their descendants. “My parents possessed the spirit of the frontier,” said Laura. Laura was the second of the Ingall’s five children. Mary, the oldest went blind at the age of 14 after a bout of scarlet fever. Next came Laura and Caroline "(Carrie)," then Freddy, who died at nine months of age, and Grace. Many details of Laura's family life on the western frontier are chronicled in her semi-autobiographical "Little House" book series. ‘‘Little House in the Big Woods’’, the first in the series, is perhaps the most autobiographical. Although Laura often changed details to better fit the voice of a children's author, all of her books were based on her recollections. Characters were based on childhood siblings and friends; stories reflected everyday chores and family togetherness through both mundane and adverse times. Laura’s father moved the family often in his search for safer and better settlements throughout Wisconsin, Kansas, Minnesota and Iowa. At one point the family lived in Indian Territory in Kansas. Although Laura was a bright student, her education was rather sporadic, a result of her family often living in isolated areas where schools were not yet established. The family eventually settled in Dakota Territory, where she attended school more regularly and worked as a seamstress and teacher at the young age of fifteen. 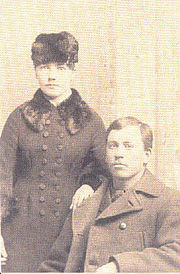 Laura’s teaching career was cut short in 1885 when she married homesteader Almanzo Wilder (1857-1949). At that time, married women were not permitted to teach. The Wilders had two children: the novelist, journalist and political theorist Rose Wilder Lane (1886–1968), who collaborated extensively with her mother on her books. The second, an unnamed son, who died tragically soon after birth in 1889. In the late 1880s, complications from a life-threatening bout of diphtheria left Almanzo partially paralyzed. While he eventually regained nearly full use of his legs, he needed a cane to walk for the remainder of his life. This setback began a series of disastrous events that included the death of their unnamed newborn son, the destruction of their home and barn by fire, and several years of severe drought that left them in debt, physically ill and unable to earn a living from their 320 acres (1.3 km²) of prairie land. Such setbacks were not uncommon for frontier families. In 1890, the Wilders left South Dakota and spent about a year resting at Almanzo's parents' prosperous Minnesota farm, before moving briefly to Florida. The Florida climate was sought to improve Almanzo's health, but Laura, unaccustomed to the heat, longed for prairie life. They soon returned to De Smet and rented a small house in town. The Wilders entered their precocious daughter, Rose, in school early and took jobs (Almanzo as a day laborer, Laura as a seamstress at a dressmaker's shop) to save enough money to once again start up a farming operation. In 1894, the hard-pressed young couple set out in a covered wagon for what would be their final destination. They settled in Mansfield, Missouri after making a partial down payment on a piece of undeveloped property just outside town that they named Rocky Ridge Farm. What began as about 40 acres (0.2 km²) of thickly wooded, stone covered hillside with a windowless log cabin evolved, over the next 20 years, into a 200 acre (0.8 km²), relatively prosperous, poultry, dairy and fruit farm. Due to the couple's perseverance and hard work, the ramshackle log cabin was eventually replaced with an impressive and unique ten-room farmhouse and outbuildings. The couple's climb to financial security was a slow and halting process. Almanzo could not always put in a full day of work so Laura was often the one to chop wood and take care of the chickens in order to produce an income for the family. Initially, the only income the farm produced was from wagons loaded with firewood Almanzo sold in town. The firewood was the early fruit of their backbreaking work of clearing the trees and stones from land that later evolved into fertile fields and pastures. The apple trees would not begin to bear fruit for seven years. Although Laura was active with her church and service clubs, most spare time was spent improving the farm and planning for a better future. Meanwhile, Rose Wilder Lane grew into an intelligent, restless young woman who was not satisfied with the rural lifestyle her parents loved. She later described her unhappiness and isolation, attributing it to her family's poverty being at odds with her own scholarly inclinations. By the time she was sixteen, dissatisfaction with the limited curriculum available in Mansfield resulted in Rose being sent to spend a year with her aunt, Eliza Jane Wilder, in Crowley, Louisiana. She attended a more advanced high school and graduated with distinction in 1904. She then returned to Mansfield. The Wilders' financial situation, while somewhat improved by this time, still placed higher education out of the question for Rose. Taking matters into her own hands, Rose learned telegraphy at the Mansfield depot and soon departed for Kansas City, Missouri, where she landed a job with Western Union as a telegraph operator. A remarkable transformation occurred in the ensuing years, and Rose Wilder Lane became a well-known, if not quite famous, literary figure. She was the most famous person to hail from Mansfield, Missouri, until Laura Ingalls Wilder—with Rose's assistance—began to publish her "Little House" books in the 1930s and 1940s. Having learned a hard lesson from focusing solely on wheat farming in South Dakota, the Wilders' Rocky Ridge Farm became a diversified poultry and dairy farm, as well as boasting an abundant apple orchard. Laura became an advocate for several regional farm associations and was recognized as an authority in poultry farming and rural living, which led to invitations to speak to groups around the region. Observing Rose's developing writing career inspired her to do some writing of her own. An invitation to submit an article to the Missouri Ruralist in 1911, led to a permanent position as a columnist and editor with that publication. Her column, "As a Farm Woman Thinks," introduced 'Mrs. A.J. Wilder' to a loyal audience of rural Ozarkians. Her columns covered topics that ranged from home and family, World War I, the fascinating world travels of her daughter, and her own thoughts on the increasing options being offered to women during this era. During much of the 1920s and 1930s, between long stints living abroad, Rose lived with her parents at Rocky Ridge Farm. As her free-lance writing career flourished, Rose successfully invested in the booming Stock Market. Her newfound financial freedom led her to increasingly assume responsibility for her aging parents' support, as well as providing for the college educations of several young people she "adopted" both in Albania and Mansfield. She encouraged her parents to scale back the farming operation, bought them their first automobile and taught them both how to drive. Rose also took over the farmhouse her parents had built and had a beautiful, modern stone cottage built for them. A few years later, when Rose left the farm for good, Laura and Almanzo, homesick for the house they had built with their own hands, moved back into it, and lived out their respective lives there. Around 1928, Laura stopped writing for the Missouri Ruralist and resigned from her position with the Farm Loan Association. Around this time hired help was moved into another new house on the property to take care of the farm work that Almanzo, now in his 70s, could not easily manage. A comfortable and worry-free retirement seemed possible for Laura and Almanzo until the Stock Market Crash of 1929 wiped out the family's investments (Laura and Almanzo still owned the 200 acre (800,000 m²) farm, but they had invested most of their hard-won savings with Rose's broker). Rose was faced with the grim prospect of selling enough of her writing in a depressed market to maintain the responsibilities she had assumed. Laura and Almanzo were faced with the fact that they were now dependent on Rose as their primary source of support. This new crisis and the ensuing Great Depression, apparently were the catalysts that catapulted Laura into preserving her memories and marketing her first book. By now Laura was skilled at turning hard times into profitable ones. During this time, Laura asked her daughter's opinion of a biographical manuscript she had written about her pioneering childhood. Little did either of them realize that Laura Ingalls Wilder, 63, was about to embark on an entirely new career: children's author. Rose's role in what became her mother's famous "Little House" series of books and her relationship with her mother during this time is a source of speculation. What is recorded through their letters, personal diaries, and draft manuscripts is that in many ways they had a typical mother daughter relationship—sometimes close, and other times at odds with each other. What is apparent, in retrospect, is that Rose Wilder contributed much to polishing and preparing the manuscripts for publication. While Laura held fast to a traditional woman's role, Rose was adept at flaunting conventions. It seems the two women's very different styles lent themselves well to a remarkable collaboration between mother and daughter. In fact, the collaboration seems to have worked to the benefit of both authors: two of Rose's most successful novels, Let the Hurricane Roar (1932) and Free Land (1938), were written at the same time as the "Little House" series and basically re-told Ingalls and Wilder family tales in an adult format. The collaboration also brought the Wilders the financial resources they both needed to recoup the loss of their investments in the stock market. The 1930s was an era in which financially strapped Americans looked back to "simpler times" and this most likely added to the appeal and overwhelmingly popularity of the "Little House" series. Indeed, Laura was begged by schoolchildren to write more of them. By the mid-1930s the royalties from the "Little House" books brought a steady and increasingly substantial income to the Wilders for the first time in their 50 years of marriage. Various honors, huge amounts of fan mail and other accolades were granted to Laura Ingalls Wilder. The novels and short stories of Rose Wilder Lane during the 1930s, represented her creative and literary peak, as well. Her name received top billing on the magazine covers where her fiction and articles appeared. The Saturday Evening Post paid her $30,000 (approximately $400,000 in today's dollars) to serialize her best-selling novel Free Land, while Let the Hurricane Roar saw steady sales that were augmented by a radio dramatization starring Helen Hayes. Her books remain in print even today as Young Pioneers. Rose left Rocky Ridge Farm in the late 1930s, establishing homes in Harlingen, Texas, and Danbury, [[Connecticut]. She eventually ceased fiction writing and spent the remainder of her life writing about and promoting her philosophies of personal freedom and liberty. She became an influential voice for libertarians in the middle 20th century. Meanwhile, Laura and Almanzo were frequently alone at Rocky Ridge Farm. Most of the surrounding land had been sold off, but they still kept some farm animals, and tended their flower beds and vegetable gardens. Almost daily, carloads of fans would stop by, eager to meet "Laura" of the "Little House" Books. They lived independently and without financial worries until Almanzo's death in 1949, at the age of 92. Laura was devastated but determined to remain independent and stay on the farm, despite Rose's request to come and live with her permanently in Connecticut. For the next several years, she did just that, looked after by a circle of neighbors and friends who found it hard to believe that their very own "Mrs. Wilder" was a world-famous author. Her driver took her into Mansfield regularly to do her errands, attend church or visit friends. During the 1950s, Rose usually came back to Missouri to spend the winter with Laura. On one occasion Laura traveled by airplane to Connecticut for a visit to Rose's home. In the fall of 1956, Rose came to Mansfield for Thanksgiving, and found her 89 year old mother severely ill from diabetes and a weakening heart. Several weeks in a hospital seemed to improve the situation somewhat, and Laura was able to return home. But she was very ill and her health declined rapidly after that point. Laura had an extremely competitive spirit going all the way back to the schoolyard as a child, and she had remarked to many people that she wanted to live to be 90, "because Almanzo had." She succeeded. On February 10, 1957, just three days after her 90th birthday, Laura Ingalls Wilder died in her sleep in her Mansfield farmhouse. Rose left Mansfield after her mother's death, but was instrumental in donating the farmhouse and most of the contents to the Laura Ingalls Wilder—Rose Wilder Lane Home Association. The farmhouse and the nearby stone cottage continue to receive thousands of annual visitors, and carry a National Historic Landmark designation. Rose inherited ownership of the "Little House" literary estate for her lifetime only, all rights reverting to the Mansfield library after her death, in accordance with her mother's will. After her death in 1968, Rose's heir Roger MacBride gained control of the copyrights through a practice called "bumping the will." MacBride was Rose's informally-adopted grandson, as well as her business agent, attorney and heir. All of MacBride's actions carried her apparent approval. In fact, at Rose's request, the copyrights to each of the "Little House" Books (as well as those of Lane's own literary works) had been renewed in MacBride's name as the original copyrights expired during the decade between Laura's and Rose's deaths. 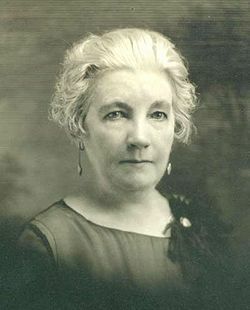 Controversy did not come until after MacBride's death in 1995, when the Laura Ingalls Wilder Branch of the Wright County Library (which Laura helped found) in Mansfield, Missouri, decided it was worth trying to recover the rights. The ensuing court case was settled in an undisclosed manner, but MacBride's heirs retained the rights. The library received enough to start work on a new building. The popularity of the Little House series of books has grown phenomenally over the years, spawning a multimillion-dollar franchise of mass merchandising, additional spinoff book series (some written by MacBride and his daughter) and the long-running television show, starring Michael Landon. Laura Ingalls Wilder has been portrayed by Melissa Gilbert (1974-1984), Meredith Monroe (1997, 1998) and Kyle Chavarria (2005) in television dramatizations. Laura once said the reason she wrote her books in the first place was to preserve the stories of her childhood for today's children, to help them to understand how much America had changed during her lifetime—and this she has done. 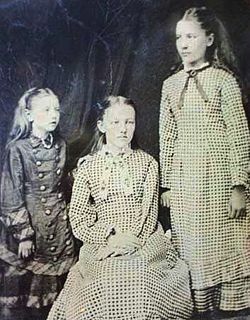 History of "Laura Ingalls Wilder"
This page was last modified on 21 June 2018, at 21:09.